Slim, fast, perfect? 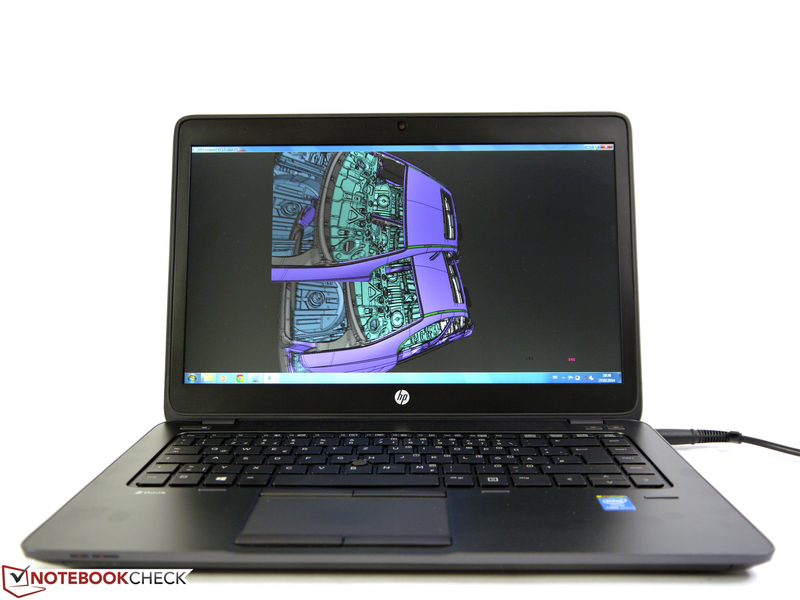 HP slimmed down its 14-inch mobile workstation this year and focused on frugal components. We tested if the device can meet the high performance requirements of the customers. 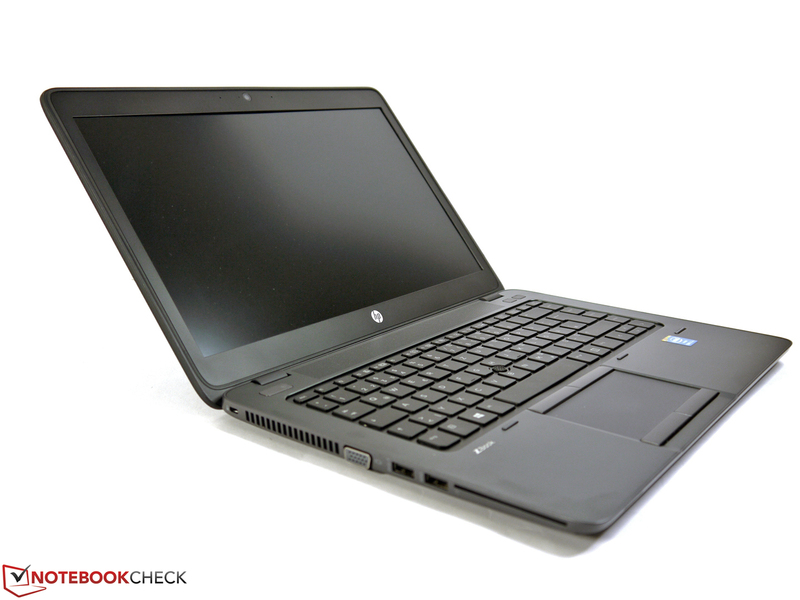 The HP ZBook 14 is the successor of the HP EliteBook 8470w and represents the new entry-level device of HP's mobile workstation lineup. 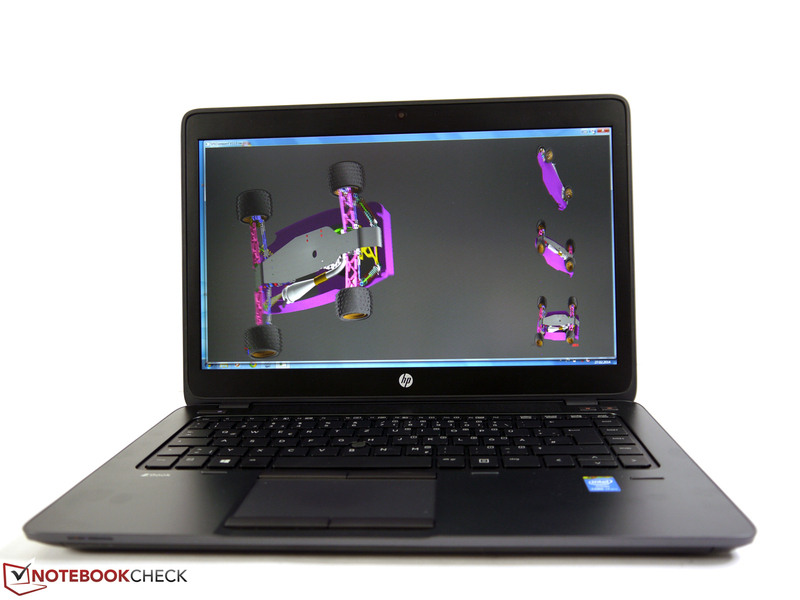 While the EliteBook still featured a traditional chassis design, HP decided to focus on mobility with the new ZBook 14. 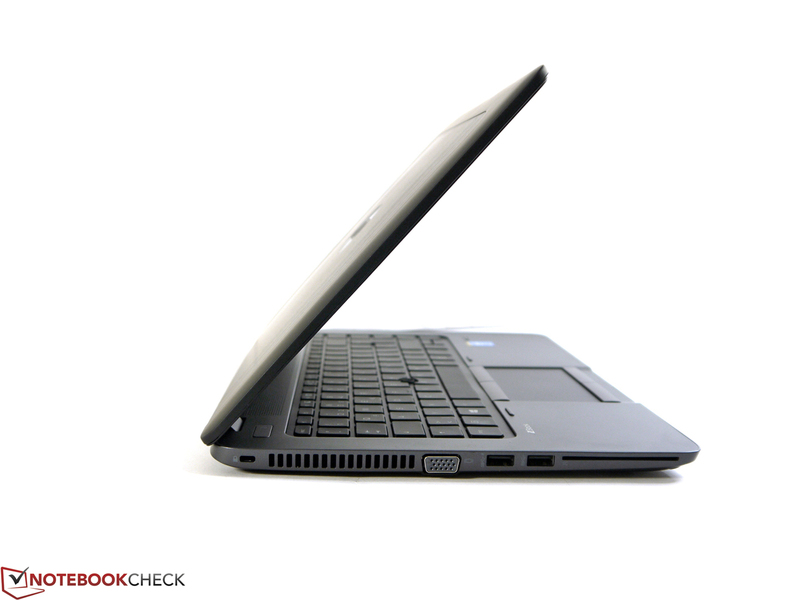 The thin ultrabook design follows the philosophy of Dell's Precision M3800, but HP integrated components that are even more frugal. Our review unit uses an Intel Core i7-4600U CPU, AMD's Fire Pro M4100-GPU, 8 GB RAM, a Full HD IPS display as well as a 256 GB SSD. The street price for this configuration is currently at around 2,150 Euros (~$2969). You can already get the base model for 1,100 Euros (~$1519), but this will obviously affect the performance and the hardware equipment. 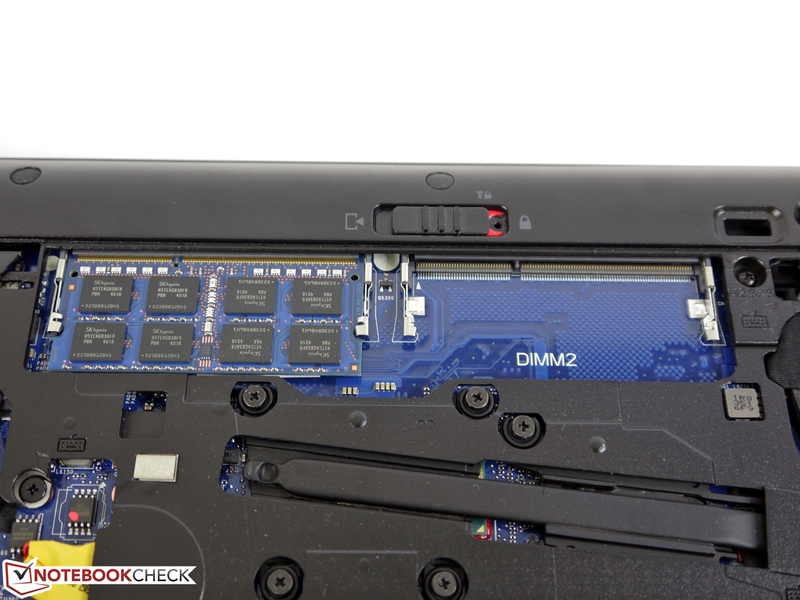 In the U.S., the ZBook 14 starts at $1399 for the base model to over $2349 for the higher-end trims. All models are equipped with the same AMD FirePro M4100 graphics, however, so the majority of the differences include additional storage space and RAM with faster Intel CPU options and a 1080p display. The new case of the HP ZBook 14 is a great success. 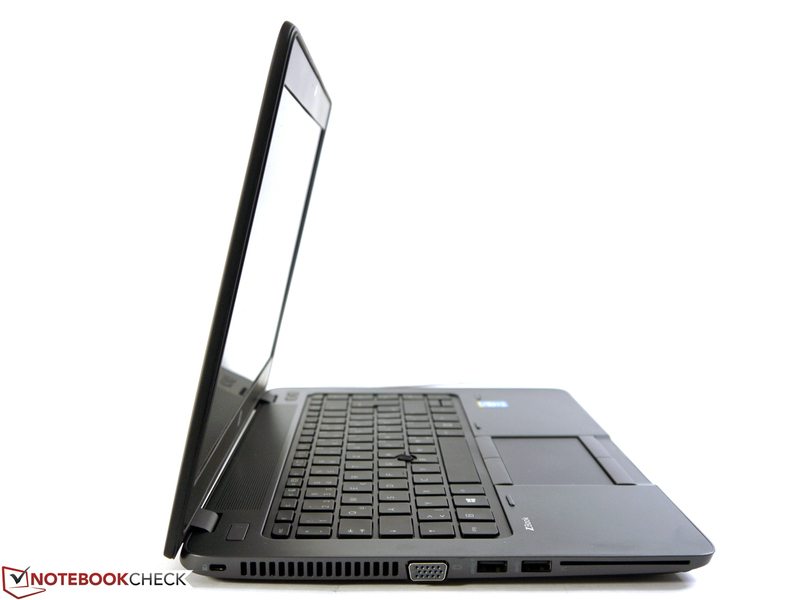 The thin chassis is very sturdy, accurately assembled and still very light. 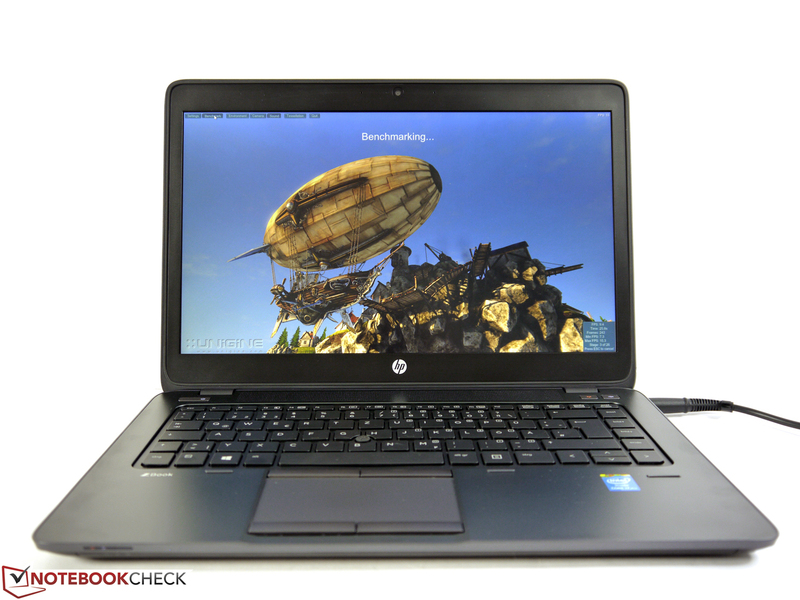 HP managed to combine the stability with high mobility. Our review unit benefits from a firm palm rest, a torsion-resistant display cover and sturdy display hinges. 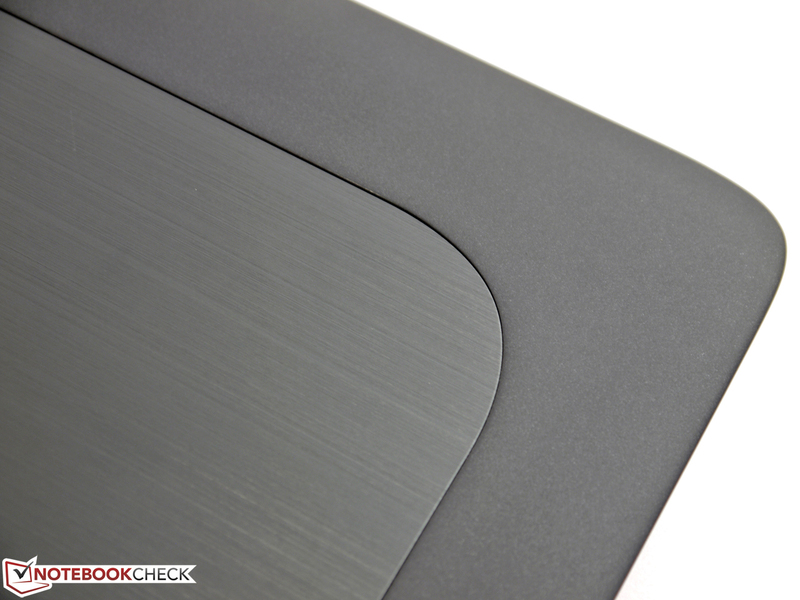 The brushed metal surfaces look and feel very good and leave a very dignified impression. Users can proudly show off the quality of the design. We just discovered one drawback: The limited maximum opening angle of the display, at least it can be compensated by the good viewing angle stability. We measure a weight of 1.8 kg (~4 pounds) and an additional 420 grams (~0.9 pounds) for the power supply unit if the battery is not sufficient for your road trip. The 50 Wh battery is underneath the bottom cover, but similar to the large maintenance cover, it is secured without screws and you can replace it in a few steps. We cannot determine any issues or restrictions here, either. HP really did an excellent job in regard to the case! 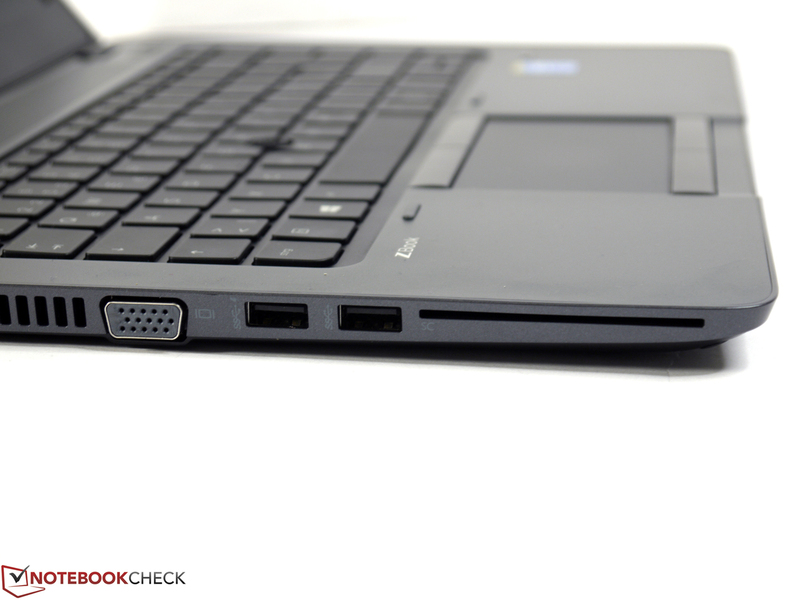 One big difference from the familiar ultrabooks is the port variety. 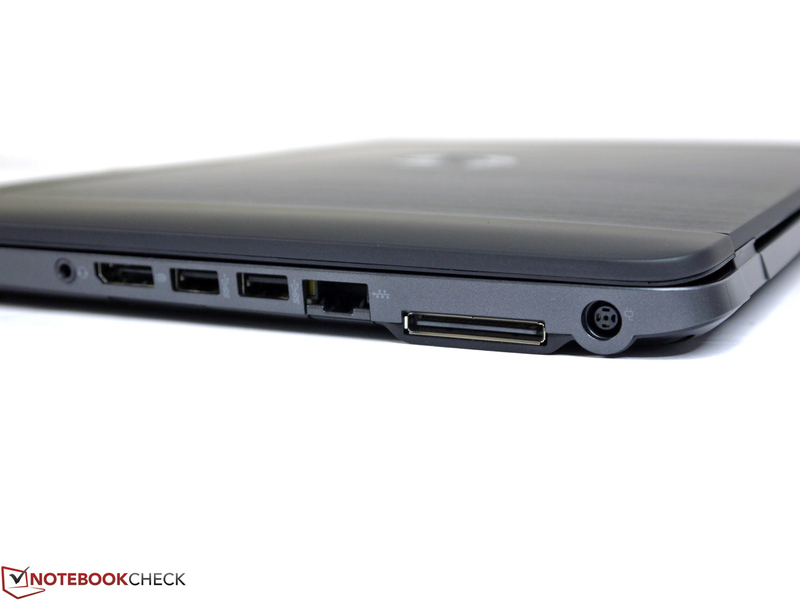 HP did not make any compromises with the ZBook 14 and integrated all the ports a modern business notebook should have. You can find an Ethernet port just like an analog VGA port, which is still used in many companies. 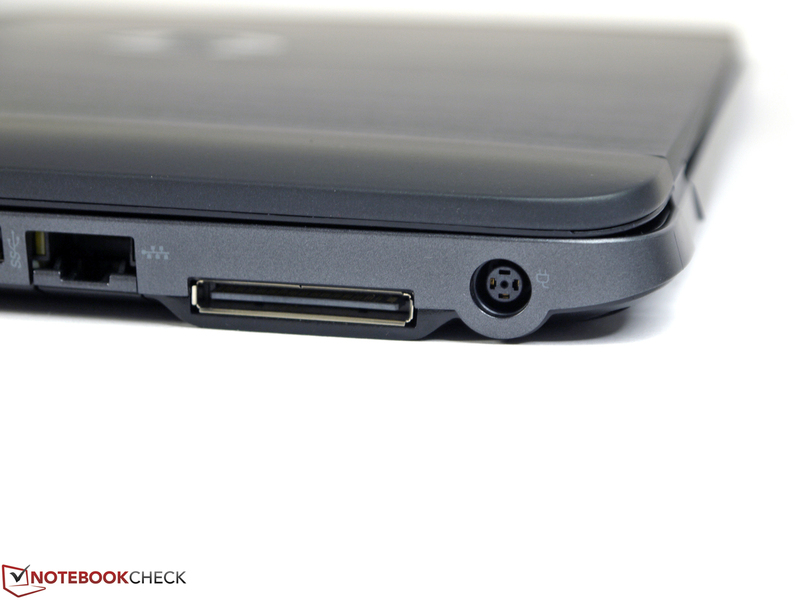 Both ports are often waived because of the limited space. The proprietary docking port is now at the side and requires, contrary to the predecessor, a new docking station. HP's 2013 Ultra Slim Docking Station (D9Y32ET#ABB) is available for around 160 Euros (~$221). Otherwise, you can use 4x USB 3.0 and attach external displays via the DisplayPort. We are not completely convinced by the position of the card reader beneath the DisplayPort because it is tricky to locate. Inserted cards are also not flush with the case and protrude a bit. The ports are very close to each other in general, so some ports can be blocked when you use certain cable/peripheral combinations. 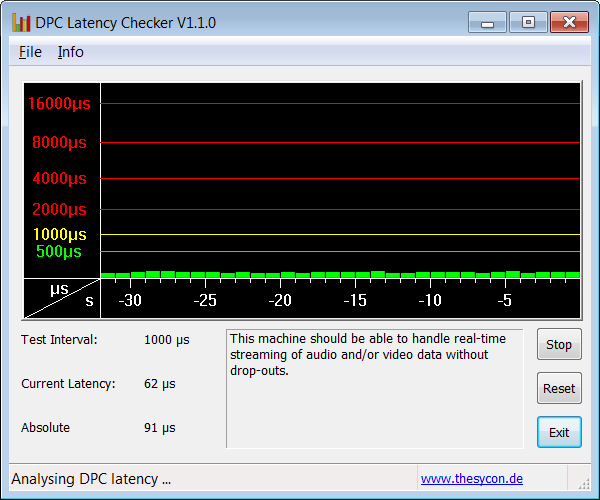 We determined sequential read speeds of 190 MB/s and write speeds of 207 MB/s at the USB 3.0 port (OZC Vector 150, 240 GB). The card reader is fast as well in combination with a Toshiba Exceria SDHC Type 2 (16 GB); we measured 89 MB/s (read) and 58 MB/s (write), respectively. Our review unit supports the WLAN 802.11n standard as well as Bluetooth 4.0. 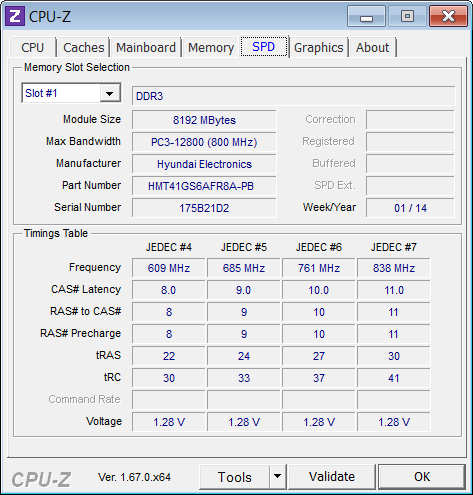 The hardware is provided by Intel with the Wireless-N 7260 Mini-PCIe module. It supports 2.4 and 5 GHz networks with transfer speeds of up to 300 Mbps. Similar to other notebooks with the same WLAN module we were convinced by the signal quality in our test and there were no sudden connection losses or other problems. Antennas for a 3G/4G module are already integrated and make the upgrading of the empty M.2 slot very easy. A 720p webcam is integrated into the display frame; the quality is sufficient for video chats in well-lit environments. You can however see that the module is not the fastest during movements, which result in artifacts. The picture quality also drops significantly if it gets darker and video recordings have problems with picture noise and unnatural colors. Connections to wired networks can be established via the integrated Gigabit-Ethernet port and do not require a USB adaptor. The security features cover all the usual business standards and you do not have to make any compromises. Besides the usual password options in the BIOS and operating system you can also use the usual features like a SmartCard reader, a fingerprint reader, a Trusted Platform Module as well as Intel's Anti Theft technology. Several HP tools, for instance, drive encryption or login when you lost your password, complement the usable repertoire. The optional system-specific accessories are basically limited to batteries, power supply units and docking stations. Besides the already integrated 50 Wh battery, which is also sold separately for around 80 Euros (~$110; E7U24AA), HP offers an additional external battery (E7U23AA, around 180 Euros; ~$249) with a capacity of 60 Wh that can be used at the same time. 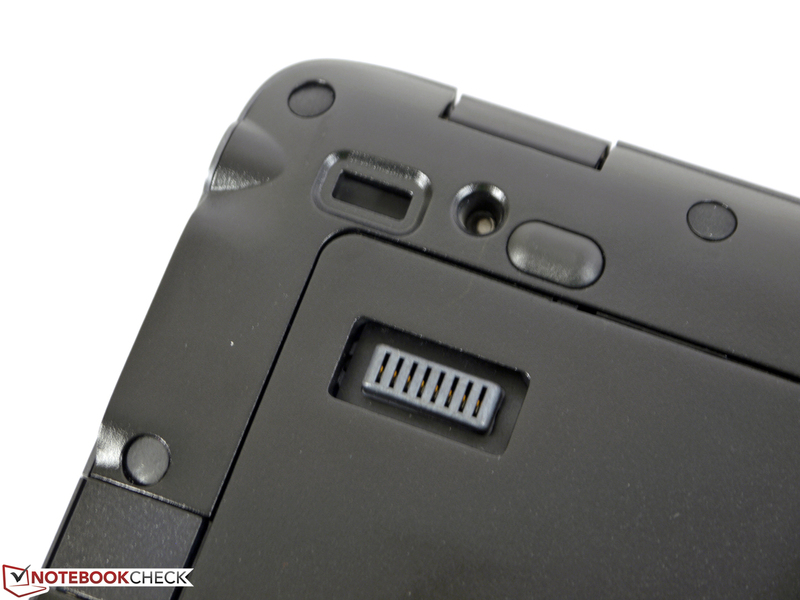 The docking stations of the predecessors are not compatible anymore, because the proprietary docking port is now located at the side of the case. 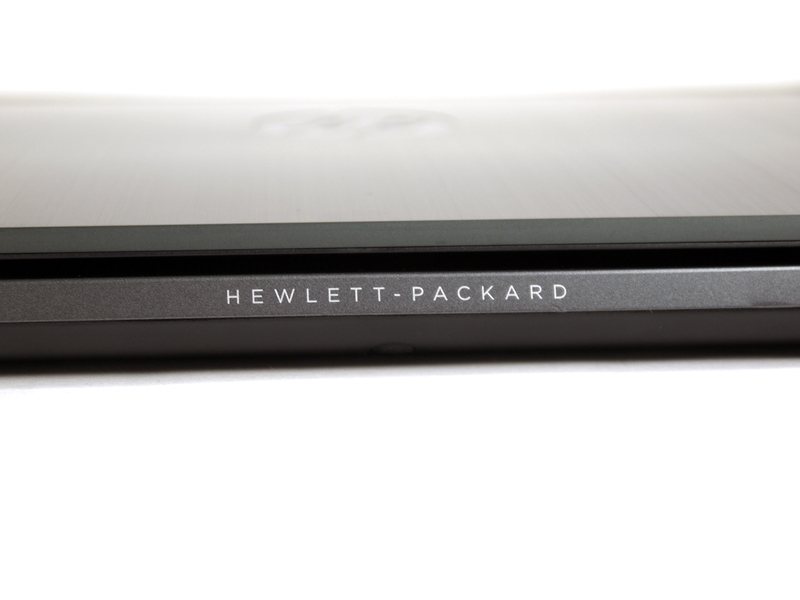 You can now use HP's new Ultra Slim docking stations that start at around 120 Euros (~$166). We already mentioned the excellent maintainability in the Case section: The bottom cover is secured without screws and can be removed very easily. You have access to all important components and ports. Storage, several M.2 slots, fan, memory slots and the battery are easy to reach and can be equipped according to your personal needs. 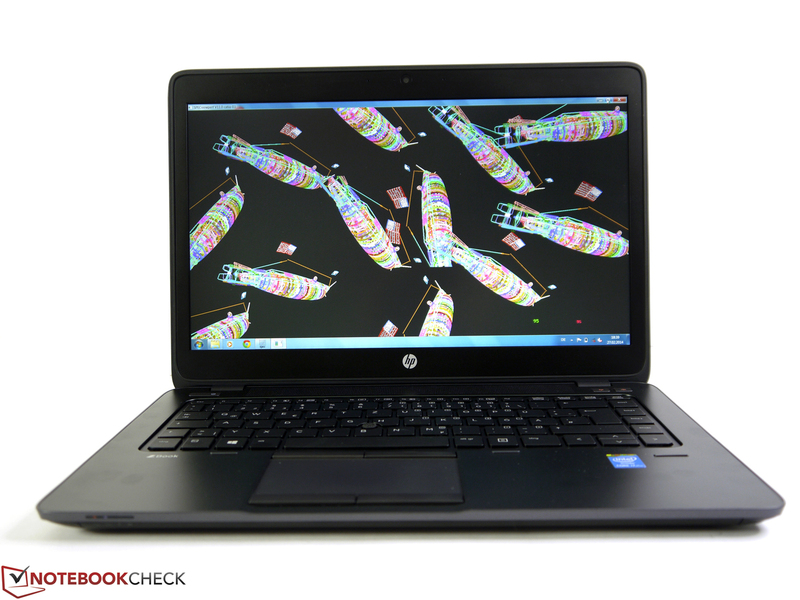 HP grants a 36-month manufacturer's warranty for its ZBooks, which is the usual business standard. You can extend the service for an additional charge. A five-year on-site service on the next business day, for instance, is available for 320 Euros (~$442). 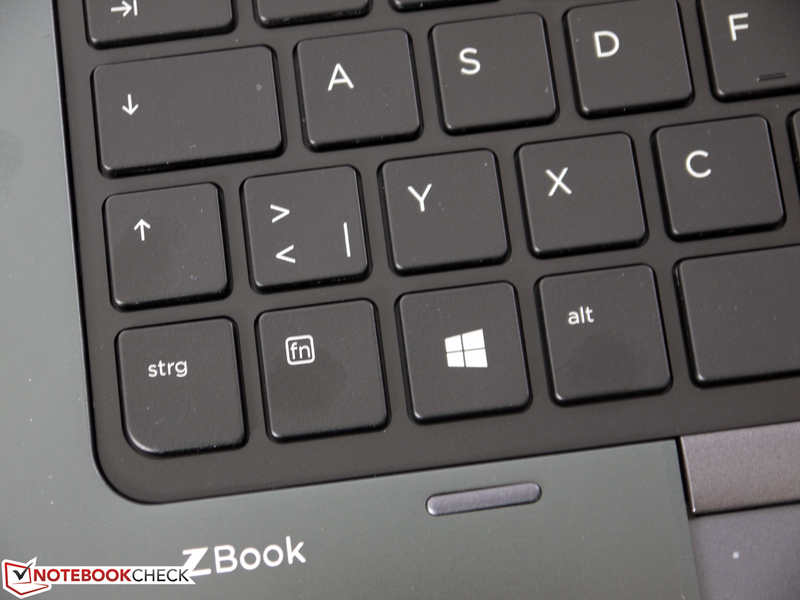 We really like the keyboard of the ZBook 14. The input device is very firm over the whole width, has a medium travel with a well-defined pressure point and spoils the user with a very quiet stroke. 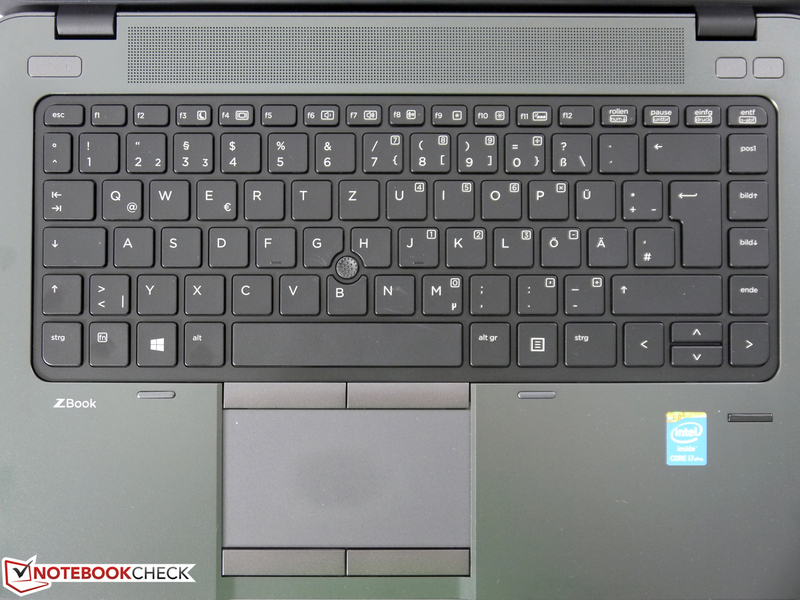 Apart from the vertical arrow keys, you get standard-sized keys, which promote a fast familiarization. The high-contrast lettering is improved by the background illumination in dark environments and improves the typing experience even further. The touchpad is comparatively large at 98 x 56 mm (~3.9 x 2.2 inches) and offers a lot of space for control with one or more fingers. Standard gestures like scrolling and zooming are activated ex-works, other gestures like Momentum or EdgeMotion have to be activated in the settings. The configurability is good and offers a practice-oriented repertoire. You can also configure the touchpad and Pointstick buttons, for example, use the Pointstick buttons as additional touchpad buttons. Buttons, touchpad and Pointstick work very well, especially the separate buttons are a blessing compared to the so-called ClickPads with integrated buttons. HP is one of the few manufacturers that apparently do not want to follow the trend towards higher-resolution displays. 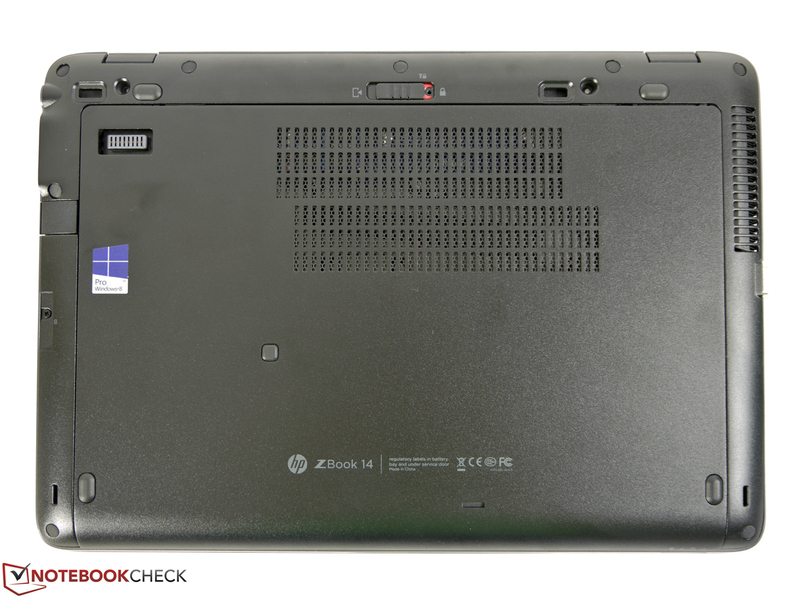 The HP ZBook 14 is only available with conventional resolutions anyway, and all panels have a non-glare surface. It is questionable whether a display with 1366x768 pixels and hardly impressive technical specifications should be available in a mobile workstation. The situation is a bit better with the HD+ panel with a more practical resolution of 1600x900 pixels. However, the viewing angle stability is probably just average, even with the touch version, because of the TN technology. Even HP only specifies standard viewing angles in the spec sheet. 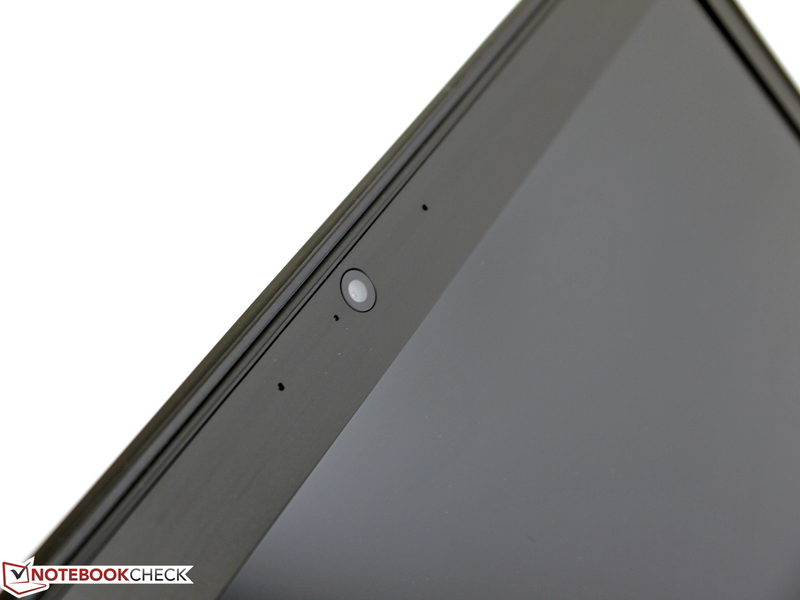 Much better is the Full HD IPS display, which is also used in our review unit. The basic requirements of a professional device should be satisfied with very wide viewing angles and a high resolution (1920x1080 pixels). The maximum display brightness varies between 280 cd/m² in the right center and 307 cd/m² in the right top. This results in an average value of 295 cd/m² and a very good brightness distribution of 91%. 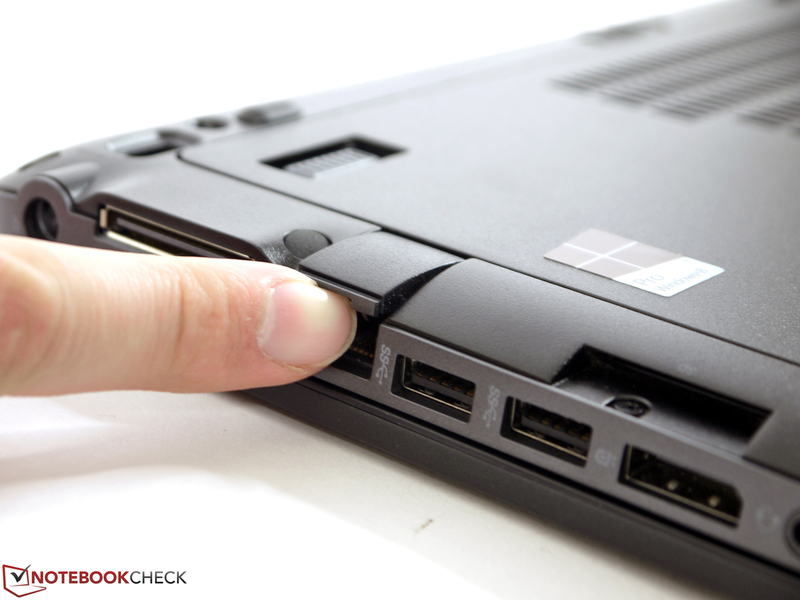 We could not determine any screen bleeding, clouding or other issues. The brightness can be precisely adjusted in 20 steps, starting with a minimum luminance of 13 cd/m² and 158 cd/m² in setting 16 (each in the center). We also use the latter setting for our battery runtime tests, and it is usually sufficient for convenient working in indoor environments thanks to the anti-reflective display surface. Working outdoors is also comfortable thanks to the maximum brightness of almost 300 cd/m². The picture content is easy to recognize and it is not disturbed by annoying reflections. Only direct sunlight reduces the comfort and you should adjust the display position accordingly. The measured contrast of 525:1 is not a top result, but it is clearly superior to the usual standard displays and does subjectively result in richer colors and a usable black. Movies, pictures and 3D presentations gain depth and are lively. The number of colors representing the supported color spectrum (around 841000) is pretty close to the sRGB standard (around 899000). However, large parts, for instance, the green-yellow area, clearly deviate from the standard and result in an actual sRGB coverage of around 80%. The calibration ex-works is not really usable for the targeted customers. The deviations from the ideal values are pretty high and are not sufficient for work that requires accurate colors. The situation improves after a calibration; grayscale presentation, gamma curve and RGB balance are almost perfect now. Not quite as good are the saturation results at 100% and the color accuracy of the primary colors. A part of the color space cannot be reproduced, so the DeltaE-2000 values of cyan and green are above 3. The ColorChecker results are better with an average DeltaE-2000 value of 0.6, but the deviation of cyan is still high at 3.81. The overall viewing angle stability is very good and the picture usually does not distort. 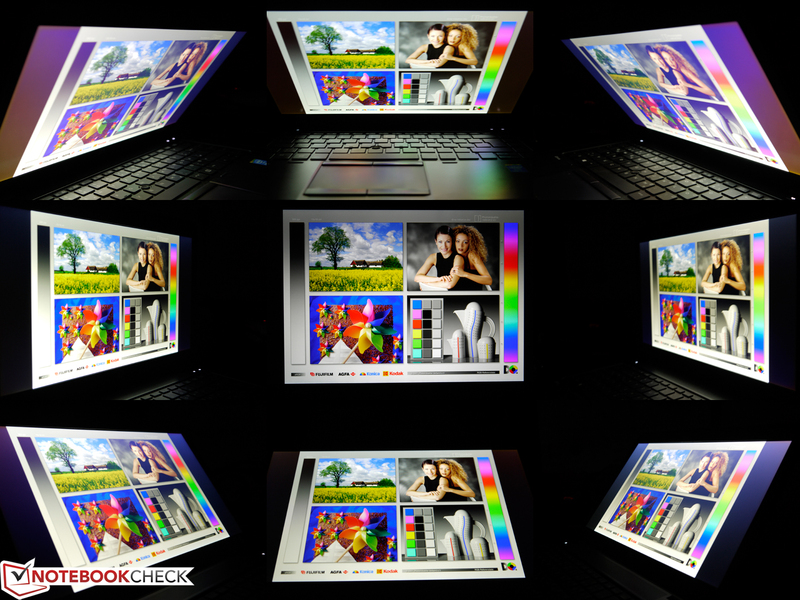 Colors, brightness and contrast only vary slightly depending on the viewing angle. You can only see a slight red hue with very wide angles. All in all a good display that can, in many scenarios, compensate for the small drawbacks in regard to the color space coverage. 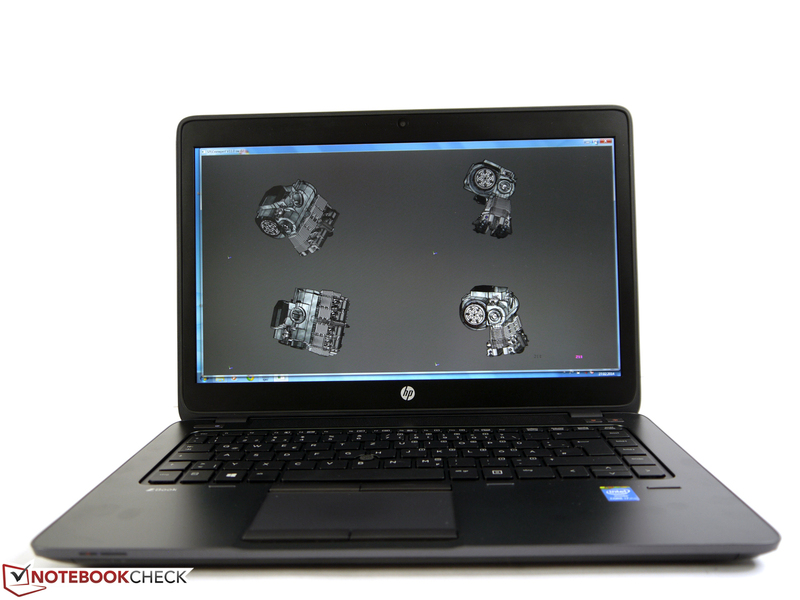 There are many configurations of the HP ZBook 14. You cannot find all combinations from the spec sheet, but the spectrum is still highly diversified and everybody should find an adequate configuration. You can configure a device in HP's online shop or choose one of the pre-configured versions. According to the spec sheet, you can select three ULV processors, different storage solutions with a capacity of up to 1 TB, 4 displays, up to 16 GB RAM as well as two GPUs. The German retailers listed 12 different configurations at the time of this review with prices starting from 1,100 Euros up to 2,200 Euros (~$1519 to $3038 respectively). Our review unit is equipped with an Intel Core i7-4600U, AMD's Fire Pro M4100 GPU, 8 GB RAM, a Full HD display and a 256 GB SSD. 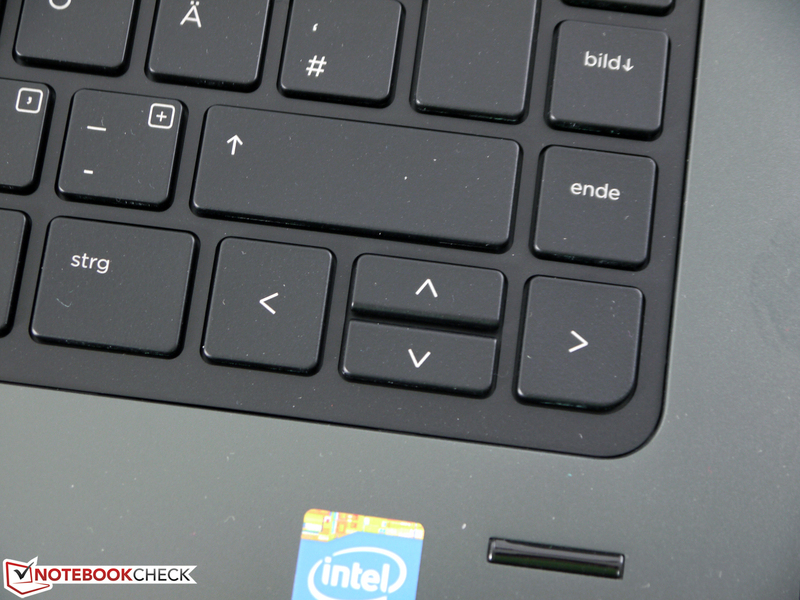 The Ultra-Low-Voltage CPU, Intel Core i7-4600U, is specifically designed for thin and enduring notebooks. It is optimized for efficiency with a TDP of just 15 Watts (including memory controller and Intel HD Graphics 4400), but the performance is clearly behind standard CPUs that are usually used for mobile workstations. However, it is still sufficient for many scenarios and the CPU can adjust to the software requirements thanks to technologies like Intel Turbo Boost (overclocking up to 3,300 MHz) and Hyperthreading (execute up to four threads simultaneously). 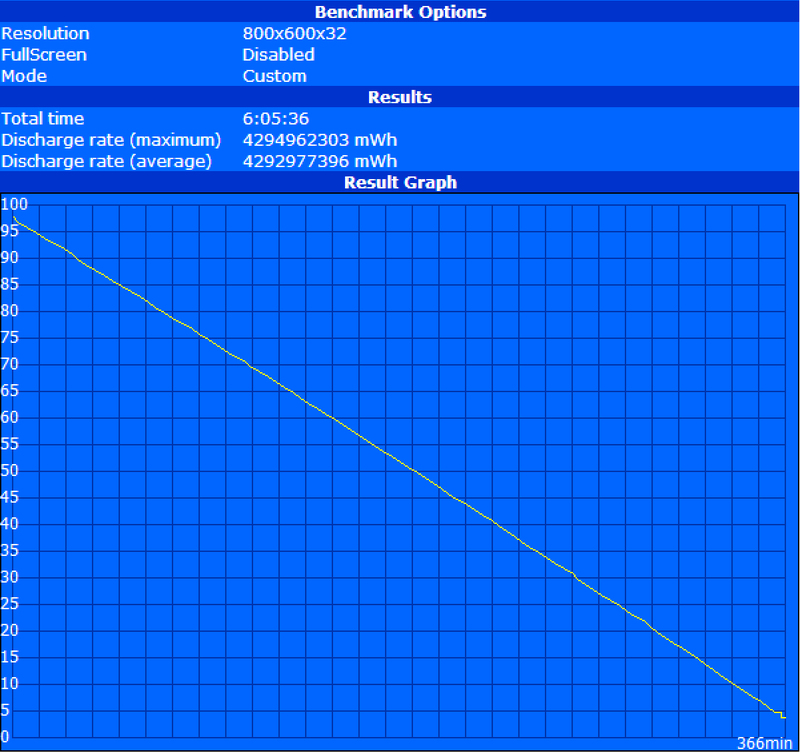 The first indicators of the performance are the CPU benchmarks. Cinebench R10 64-bit for example determines 6,146 points (Single-Core) and 12,069 points (Multi-Core). The deficit compared to an entry-level quad-core like Intel's Core i7-4700MQ is quite small and will hardly be noticeable in practice. The situation does however change when the load is distributed to many cores/threads. 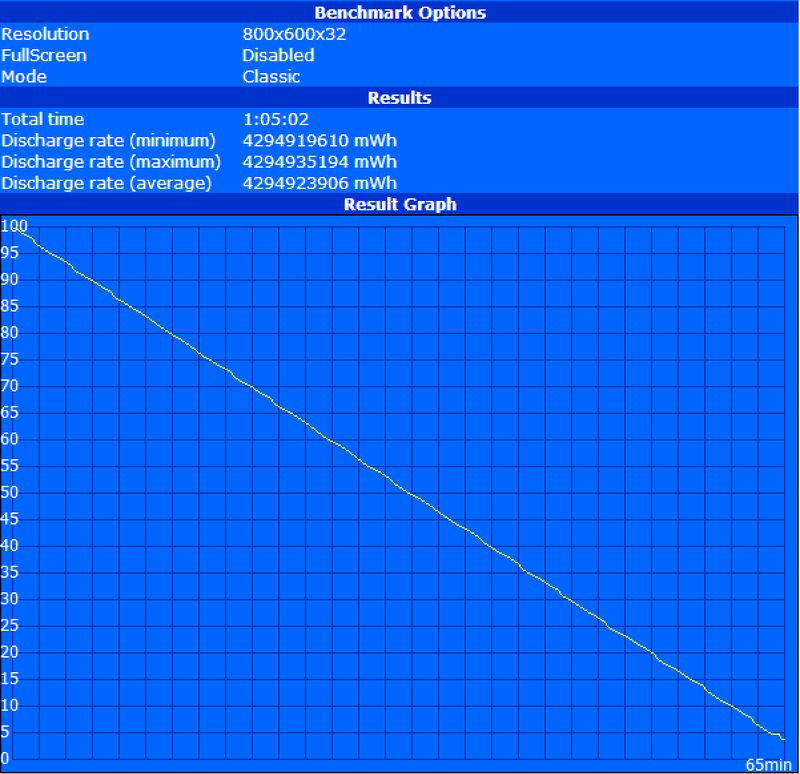 In this case, the standard CPU inside the Lenovo ThinkPad W540 is almost twice as fast with 23,677 points. 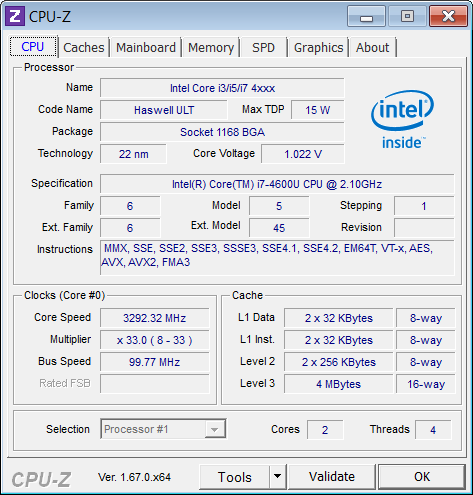 Another indicator for the performance of the Intel Core i7-4600U is our practical test. The audio conversion of MP3 files into the AAC format via iTunes (single-core) benefits from the high clock of the ULV processor and manages 49.5 times the speed. The difference to the nominal faster competitors is once again comparatively low. It gets much bigger if the application has a good multi-core support, like Cyberlink's MediaEspresso. Our review processor almost needed twice as long in many cases before we could see the result. 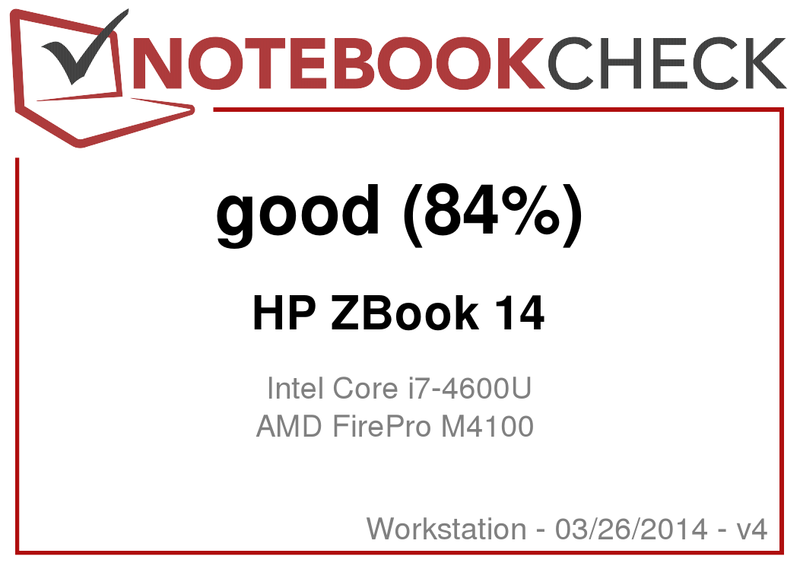 Our ZBook 14 did not have any problems with stability. The clock never dropped below the nominal value, even after more than 4 hours of continuous maximum load for the CPU and GPU. Battery power on the other hand reduces the processor performance by around 25%. 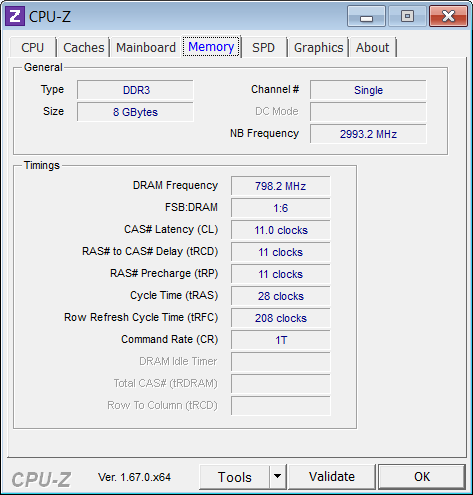 Cinebench R11.5 64-bit for example only resulted in 2.28 instead of 2.95 points. The fast Solid State Drive can compensate for some weaknesses of the CPU (multi-core performance) and the unfavorable memory equipment with a single-channel configuration. 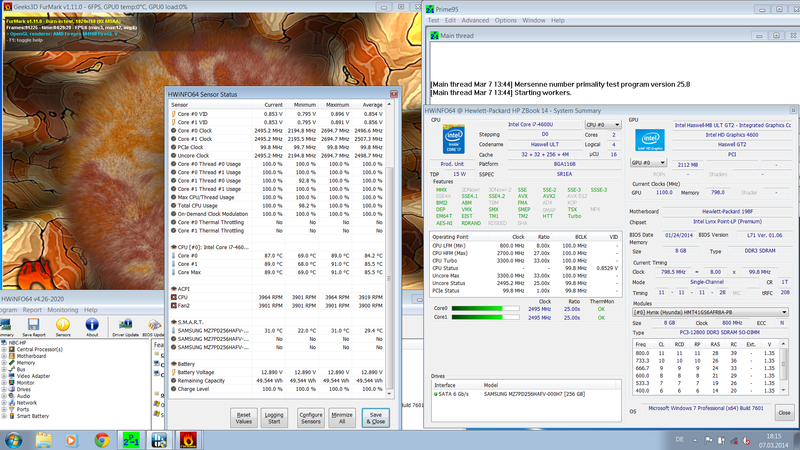 Especially powerful workstation rivals with conventional hard drives clearly fall behind. This can be seen not only in the performance advantage of the Solid State Drive in the benchmark result, but also in practice with a very snappy system. Starting the system only takes 6 seconds, applications and files open with almost no delay and data transfers of large folders are very fast. 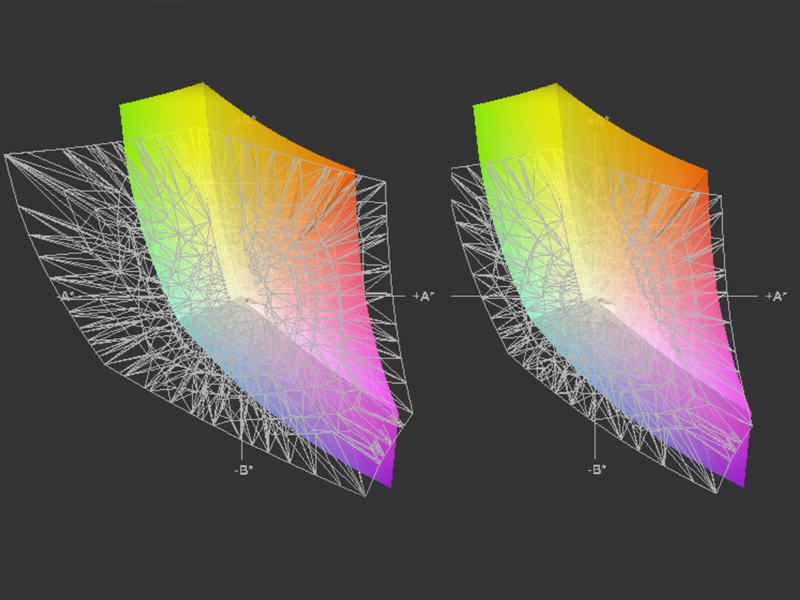 Only very demanding, high-resolution 3D applications and very complex multi-core tasks bring the system to its limits. You can optimize the memory performance and therefore the performance of the Intel HD Graphics 4400 with a second memory module. Besides the larger memory, it enables a dual-channel memory configuration, which improves the overall performance as well. 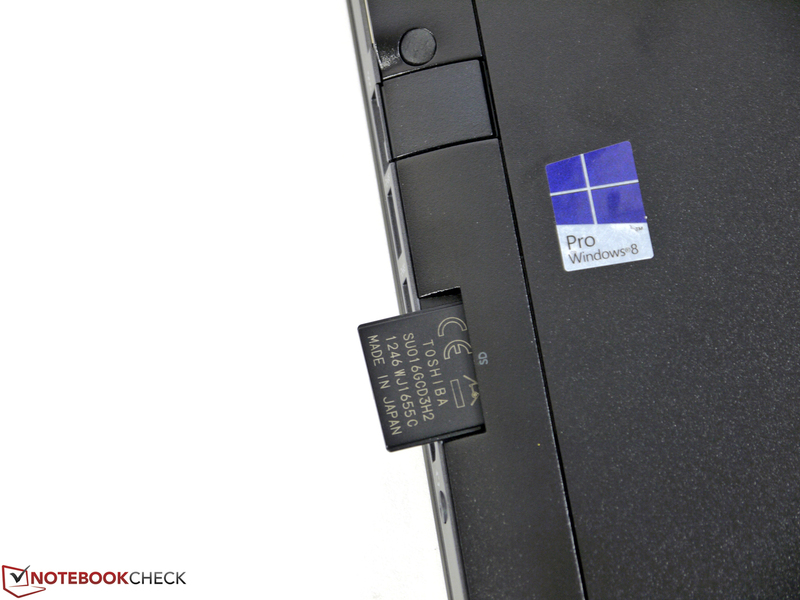 HP uses the popular Samsung SSD 840 Pro with a capacity of 256 GB. It is in the top spots of the charts for months in several price comparisons and is often used because of the good price-performance ratio. Sequential transfer rates of more than 500 MB/s (read) and more than 400 MB/s (write) are very fast. The access time and the good performance processing small files are also good characteristics that improve the system performance. The only drawback is the long-term stability, which cannot keep up with the best drives, for example the OCZ Vector 150-series or Intel SSD 520. 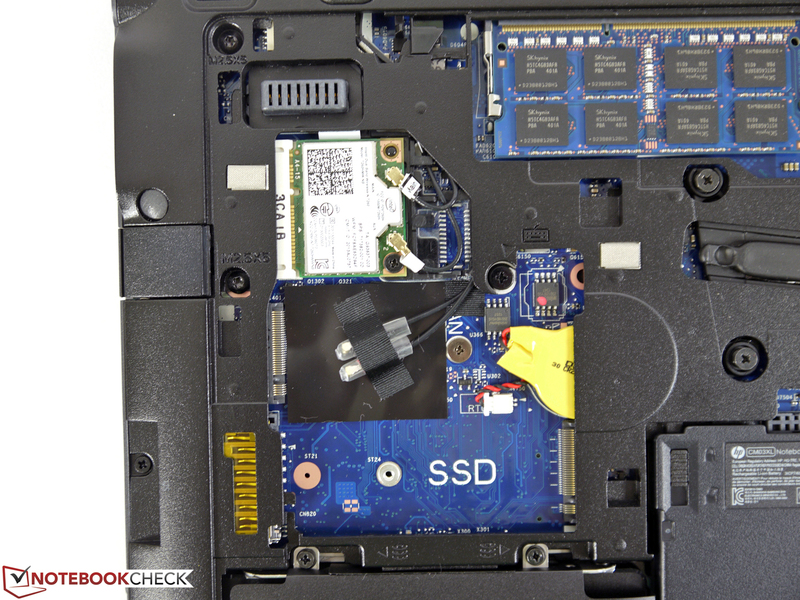 Expanding the storage of the ZBook 14 is possible with an M.2 SSD. 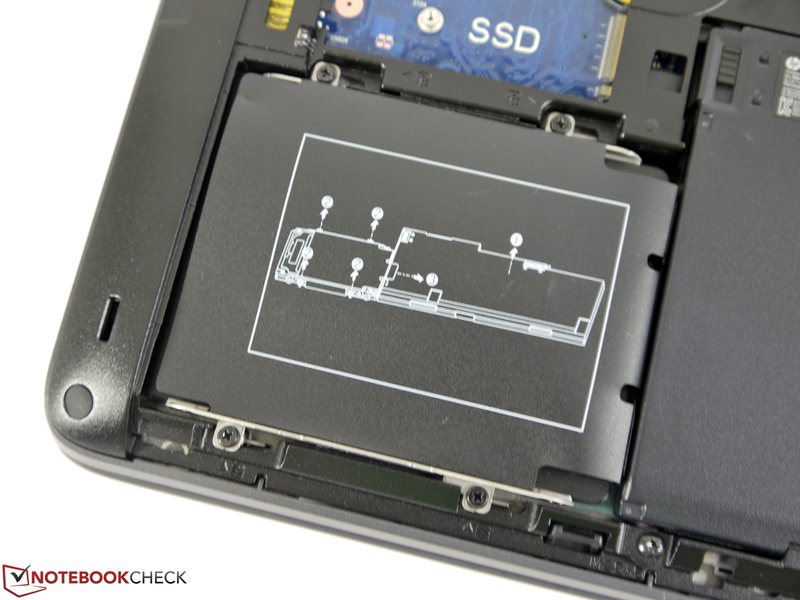 Due to the threading of the screws, you can only use SSD modules with a length of 42 mm, but these modules are still unfortunately hard to come by. 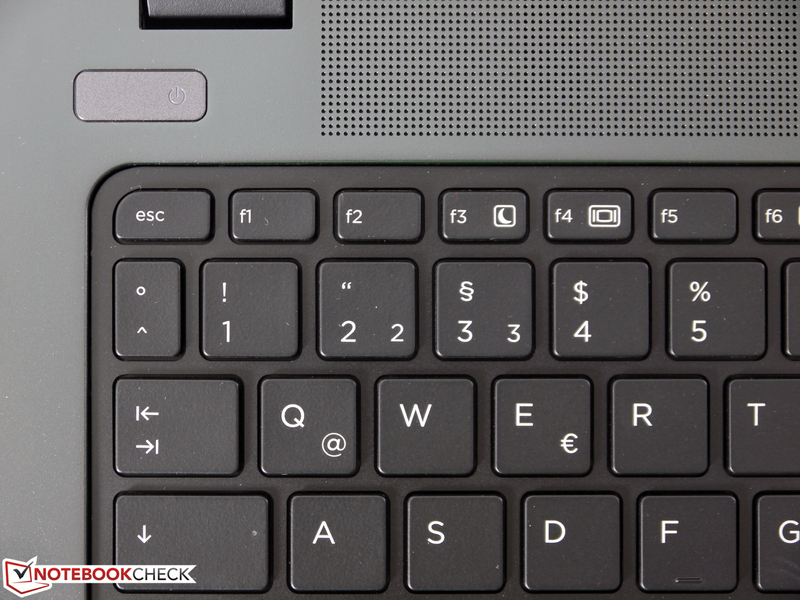 Contrary to the predecessor HP EliteBook 8470w, the HP ZBook 14 supports switchable graphics. Less demanding scenarios are usually handled by the integrated Intel HD Graphics 4400, while more complex 3D calculations in professional environments use the AMD FirePro M4100. Similar to Nvidia's Quadro-series, the dedicated AMD FirePro M4100 is optimized for professional tasks and comes with a special BIOS as well as adjusted drivers. Especially OpenGL-optimized CAD applications benefit from this; standard consumer GPUs cannot keep up with the performance. AMD's FirePro M4100 is an entry-level professional GPU, so we did not expect top results in the first place. The two benchmarks SPECviewperf 11 and 12 show that it can only roughly keep up with the competition from Nvidia in Lightwave and SolidWorks, while it can actually beat the Nvidia Quadro K610M in Maya by a few percent. Otherwise, the performance is rather disappointing and clearly falls behind the competition. It remains to be seen if upcoming driver optimizations can improve the situation. AMD's FirePro M4100 cannot be assigned to Cyberlink's MediaEspresso. Another increasingly popular scenario for graphics cards is the GPGPU computing. 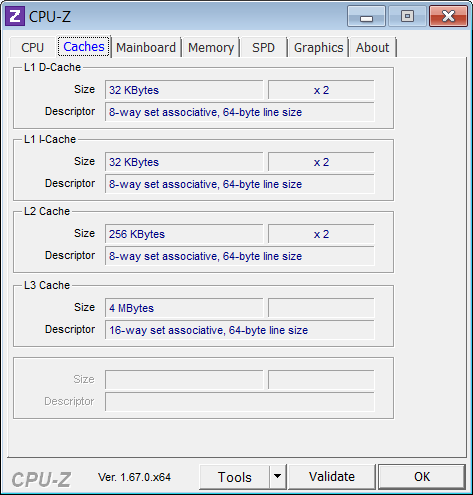 Calculations via OpenCL, AMD APP or Intel Quick Sync are transferred to the GPU and reduce the load for the processor and the overall system, respectively. It really depends on whether the used application supports it at all and which technology is supported. Furthermore, the GPGPU support is usually limited to some functions (for example filters for picture and video editing) and often does not offer a general acceleration. We tested several OpenCL operations, which include financial analysis, cryptography, ray tracing and picture editing. 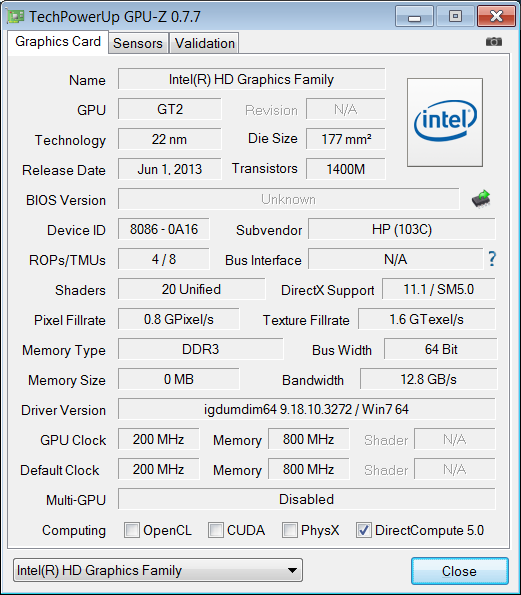 We also use Intel's Quick Sync Video for GPU video conversion. 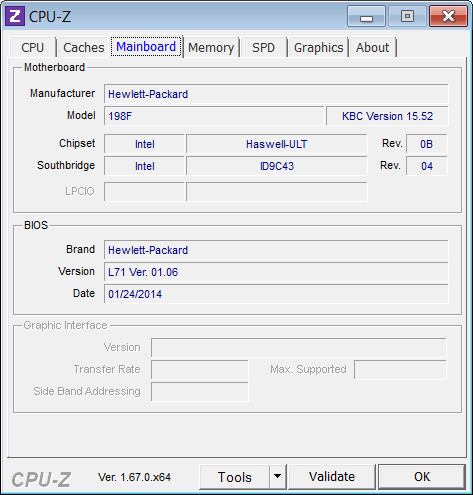 AMD's APP (Accelerated Parallel Processing) could not be used with Cyberlink's MediaEspresso. The results of the video conversion are displayed in the Processor section. 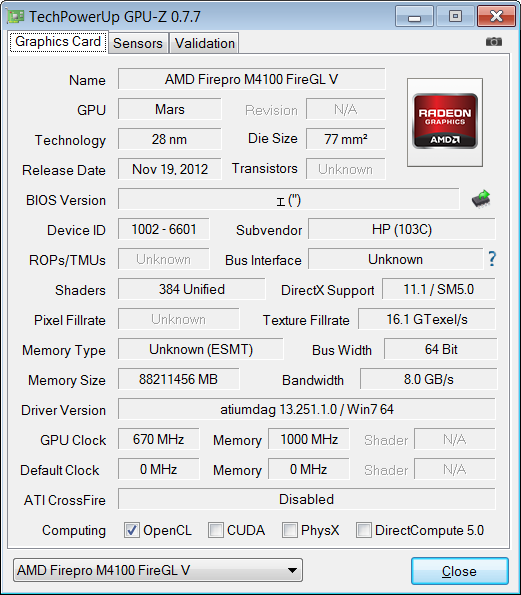 AMD's FirePro M4100 leaves a good impression in the picture editing, the financial analysis as well as the decryption/encryption with double precision and can keep up with the more powerful rivals from Nvidia and even beat them. Within our competition, only the Nvidia Quadro K3100M can beat our review unit in the Room scene (Ray tracing/Luxmark). The familiar benchmarks, which are primarily designed for consumer GPUs, show that the performance is comparable to the AMD Radeon HD 8730M or the Nvidia GeForce GT 630M. 3DMark 11 determines 1,281 points, Heaven 3.0 10.9 fps and Cinebench R10 OpenGL Shading 6,578 points. The GPU performance was hardly reduced on battery power; Cinebench R11.5 Open GL Shading resulted in 35.68 instead of 37.07 fps. 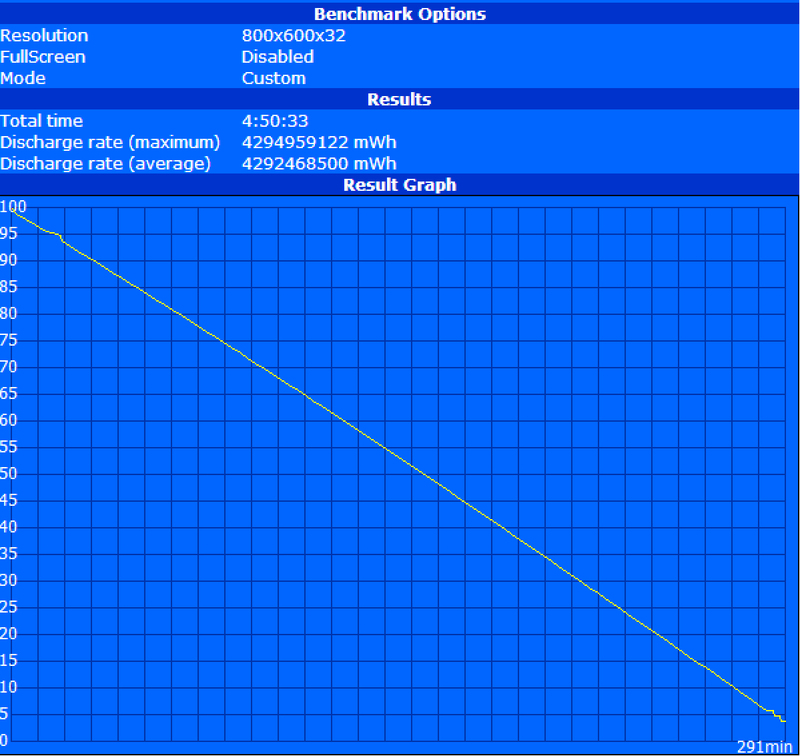 Update 03/26/2014: After some comments on the forums regarding the low 3DMark 11 result, we had the chance to test a second device from the US editorial office. This time 3DMark 11 determined 1,921 points, contrary to our review unit it was equipped with the driver version atiumdag 13.250.18.1000/WIN 7 64. We also performed another Cinebench R11.5 Open GL test, but the result was very similar with 37.8 fps. The gaming capabilities are essentially limited to low settings in our test games. Unfortunately, we could neither use the standard resolution of 1366x768 pixels on the internal nor an external display. It did not help to add the resolution in the GPU driver, either. However, the results indicate that titles like Hitman Absolution or Company of Heroes are hardly playable at all anyway. GRID 2 and Diablo 3 on the other hand work well with the medium settings and old games like Sims 3 and World of Warcraft can even be played in the highest settings. The noise development of the thin workstation is almost exemplary. Light workloads, for instance, office tasks, web browsing or communication do not result in any noise at all; the review unit is completely silent. 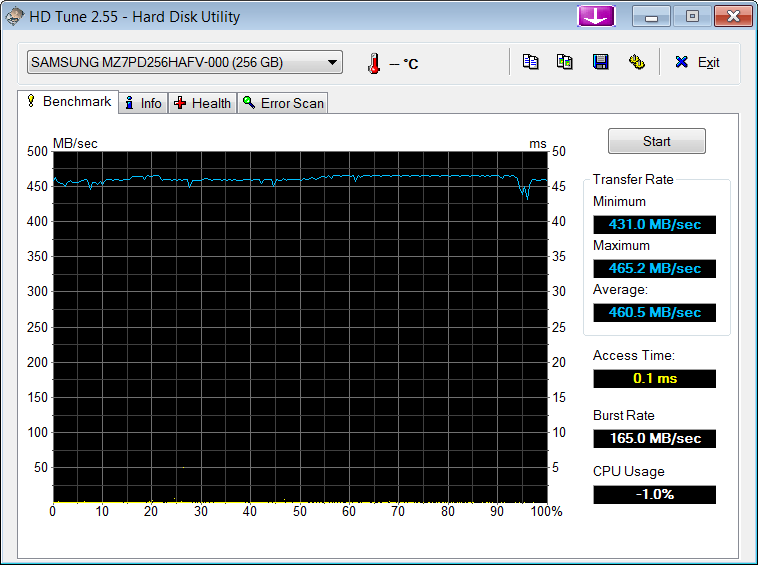 This is mainly a result of the Solid State Drive and the only occasionally rotating fan. 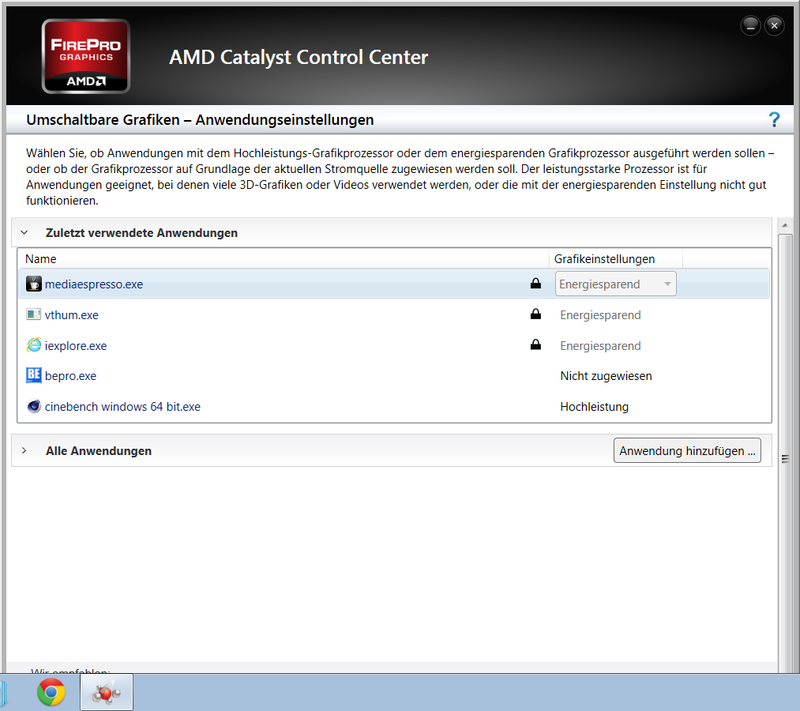 The BIOS option "Fan always on when AC" was already deactivated for once. Medium workloads result in an increased noise of a moderate 37.6 dB(A) and we measured 41.3 dB(A) under maximum load. We could not determine high-pitched noises, humming or a pulsating fan. Despite the thin chassis and the fairly powerful components, the case temperatures are still tolerable. We measured a maximum value of almost 46 °C (115 °F) at the top and bottom (each at the center) of the ZBook 14 after one hour of continuous load. 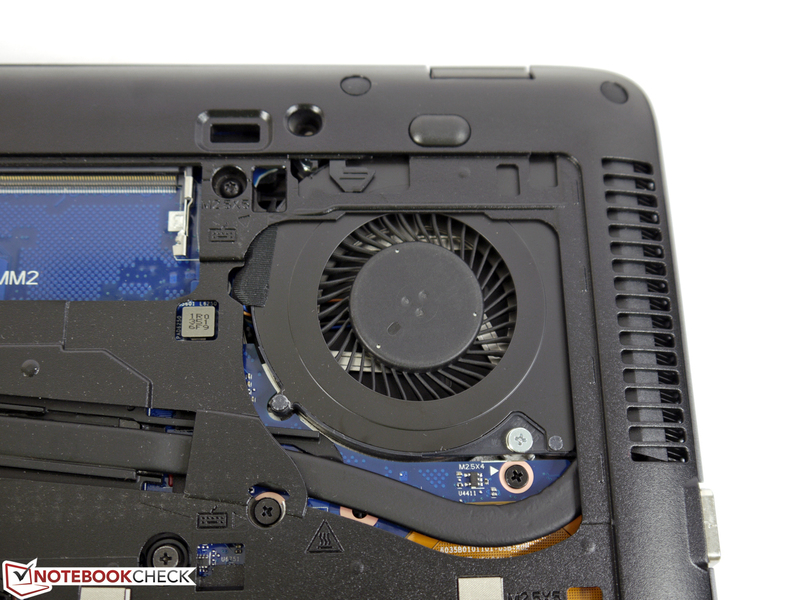 This is the area where the powerful components are located, but the cooling system does a good job of dissipating the heat. The only uncomfortable spot is around the fan exhaust with 50.5 °C (123 °F) and direct contact should be avoided. The surfaces stay very cool with up to 31.6 °C (89 °F) during light workloads, despite the barely rotating fan, and there should not be any restrictions. The sound quality is, similar to many other rivals, very focused on the high tones and there is no balance between the medium tones and bass. Overall, the sound characteristic lacks power to be useful for multimedia tasks. Another problem is that the maximum volume is not sufficient for presentations in larger rooms, which means you will have to attach external speakers. 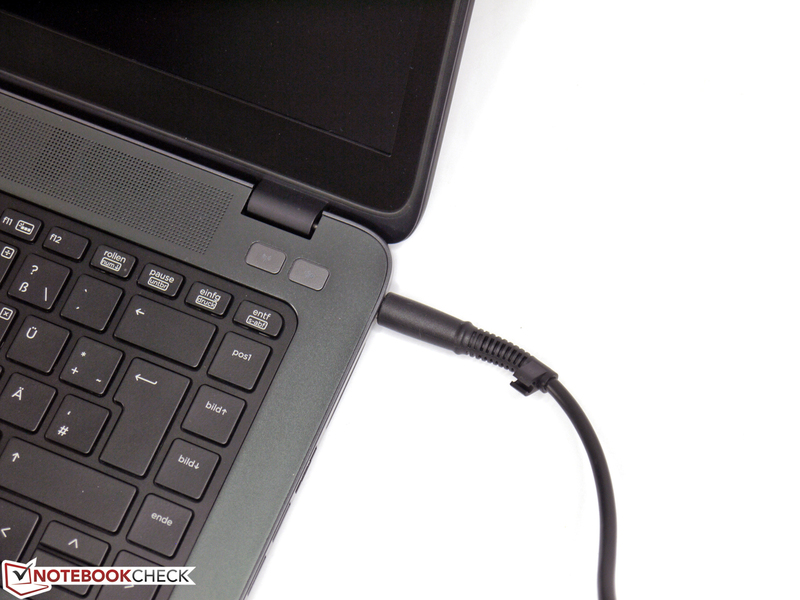 Besides the 3.5 mm-stereo jack, you can also use USB or Bluetooth for external solutions. 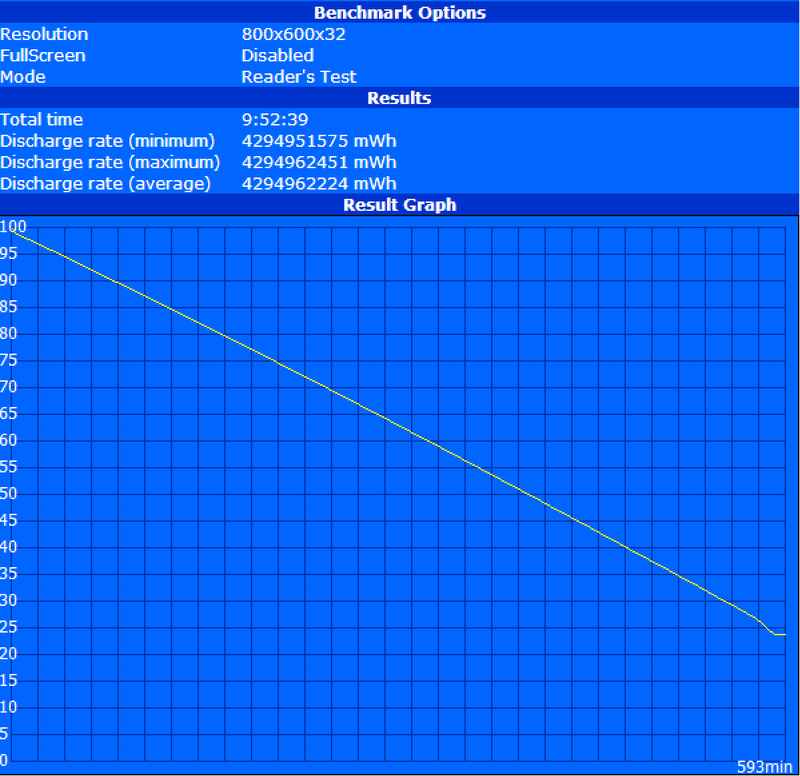 We measured power consumption between a minimum of 5.6 Watts and a maximum of 66.3 Watts. The maximum value is just a small spike that drops to 51.8 Watts after the CPU leveled off at its nominal clock. You can easily replace the internal 50 Wh lithium polymer battery after you removed the screwless bottom cover, which meets the high demands of the business customers. 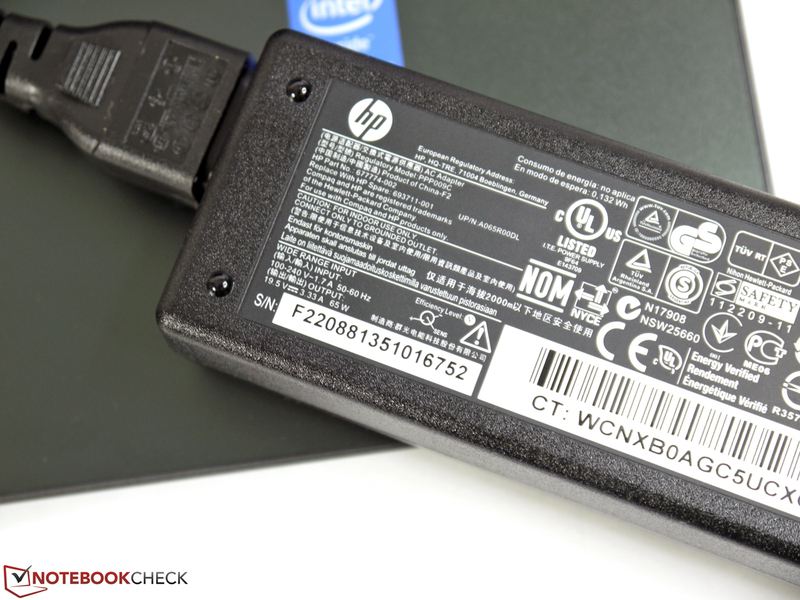 HP also offers another internal battery with a capacity of 24 Wh. You can expand the capacity with an external battery, which should more than double the runtime with its capacity of 60 Wh. More information can be found in the Accessories section. Our results for the battery runtimes show the strengths of our review unit. Realistic runtimes of 5 up to 6 hours (luminance at 150 cd/m², Intel HD Graphics, video and WLAN test) clearly beat the other workstation rivals. 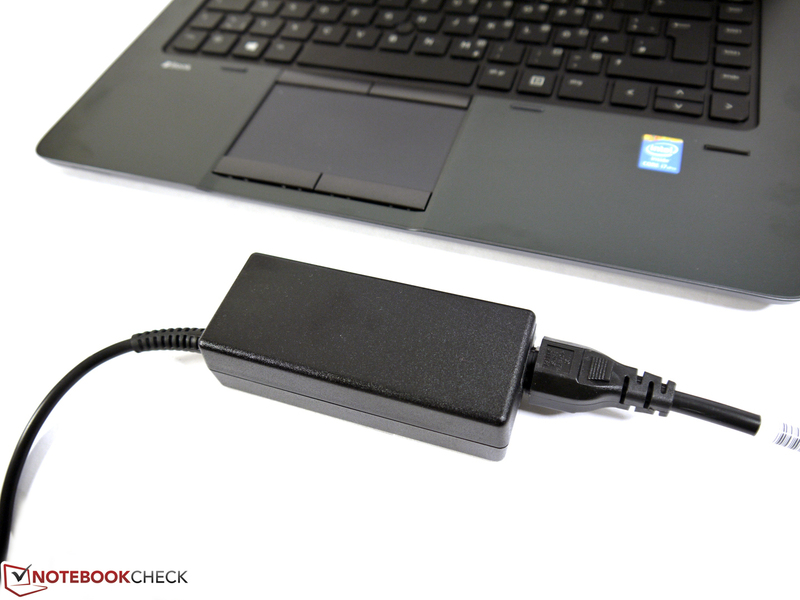 We even reached almost 10 hours in the Battery Eater Reader's test (minimum display brightness, wireless off, energy-saving mode), but the dark display and the reading of a document are not very realistic for this notebook category. Another very unlikely scenario is maximum load on battery power (Battery Eater Classic test); our review unit managed around one hour. Maximum display brightness, all adaptors activated and maximum CPU and GPU load are rather unusual on battery power. 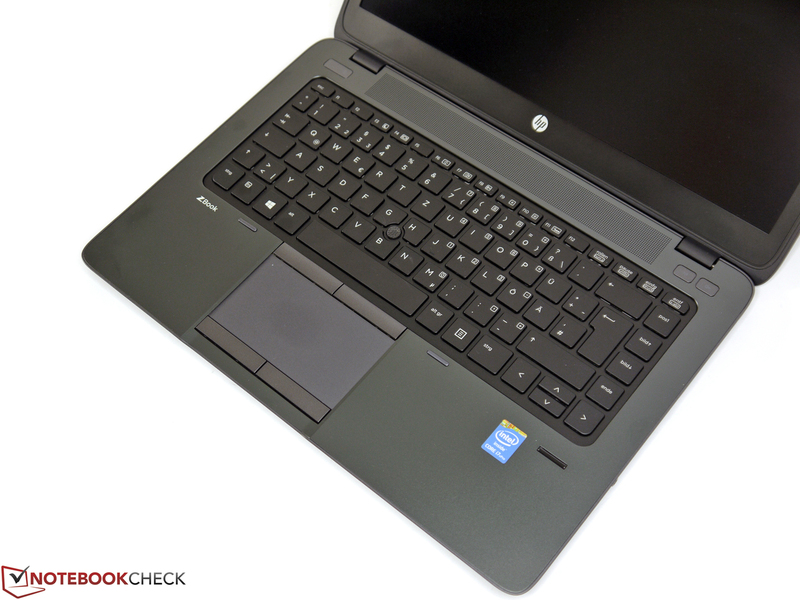 The HP ZBook 14 is the most mobile workstation we reviewed so far. It is light, thin, enduring and easy to transport. 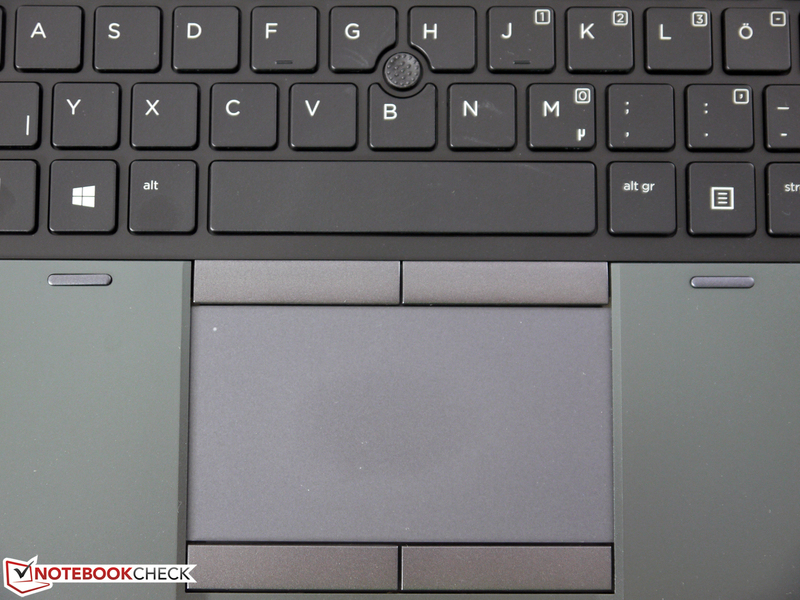 Build quality, case features and the design have not been neglected either, but represent the high quality of the ZBook-series. We also really liked the low system noise and the low case temperatures during light workloads. We are positively surprised by the exemplary maintainability of the small device. 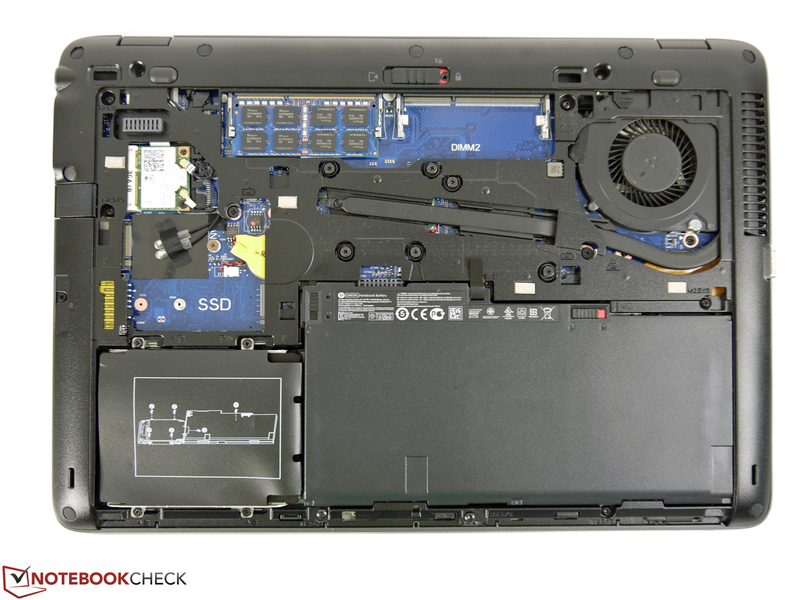 The ZBook 14 almost sets new standards for thin notebooks with the screwless access and the easily replaceable components. Highly recommendable is the Full HD IPS display of our review unit. It has very good specifications and can be used for almost every scenario. Only small deviations in regard to the color accuracy and the limited sRGB coverage could scare off some users. One thing that is not on the same level with bigger workstations is the performance. Especially CAD tasks suffer a bit from the low performance of the AMD FirePro M4100 and you will have to make some compromises concerning the processor performance due to the ULV technology. The system does, however, benefit from the fast Solid State Drive that can improve the subjective performance impression and somewhat compensate the occasionally missing CPU and GPU power. Not unusual for a mobile workstation is the elevated noise and temperature development under maximum load. 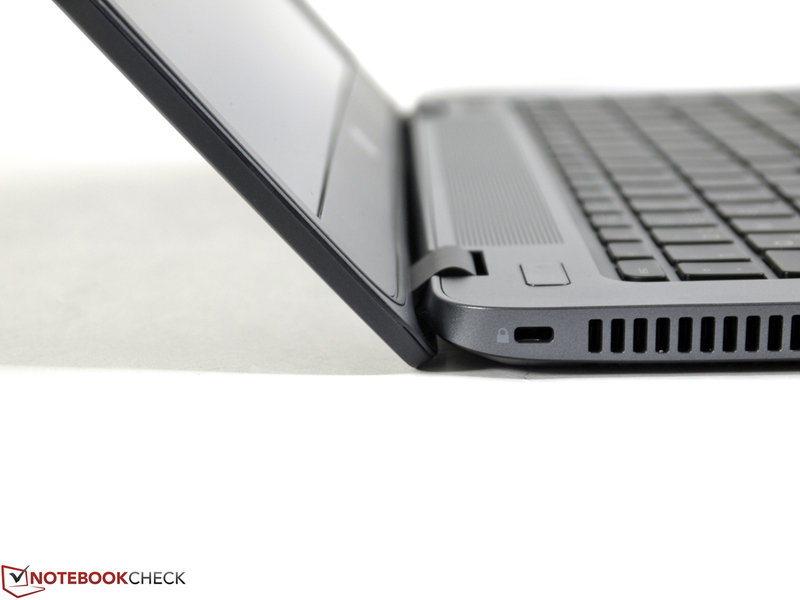 This applies for the HP ZBook 14 as well, but it is still tolerable compared to some rivals. You will also have to make some compromises in terms of port layout. The ports are crowded and the accessibility is not always perfect. Without compromises on the other hand is the warranty period of 36 months, which is standard for business devices, and of course the price. It really meets the exclusive premium level at around 2,150 Euros (~$2969). 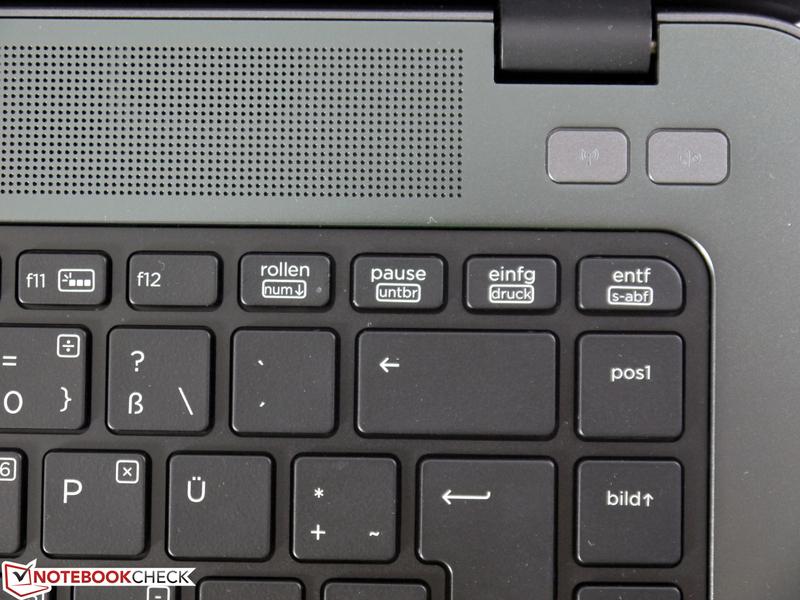 HP ZBook 14, review unit courtesy of HP Germany. 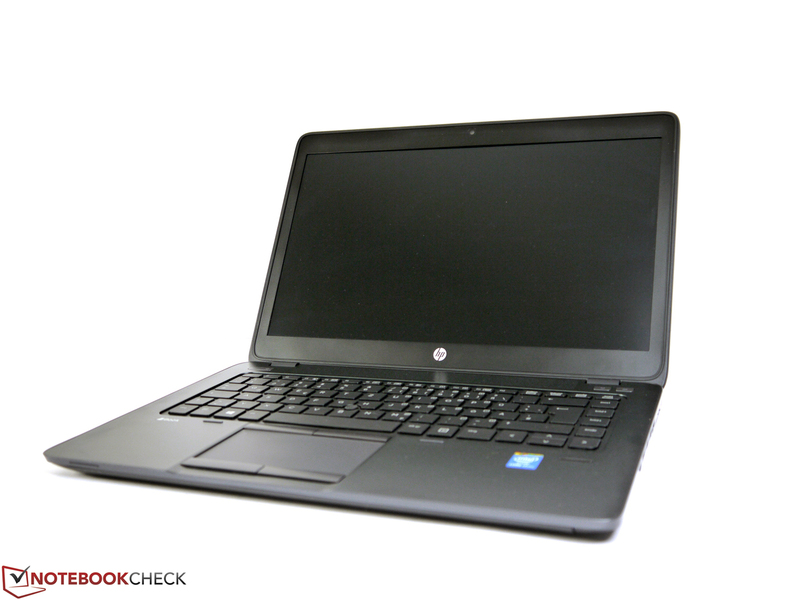 The HP ZBook 14 is the successor of the HP EliteBook 8470w. ...but there are some big differences. 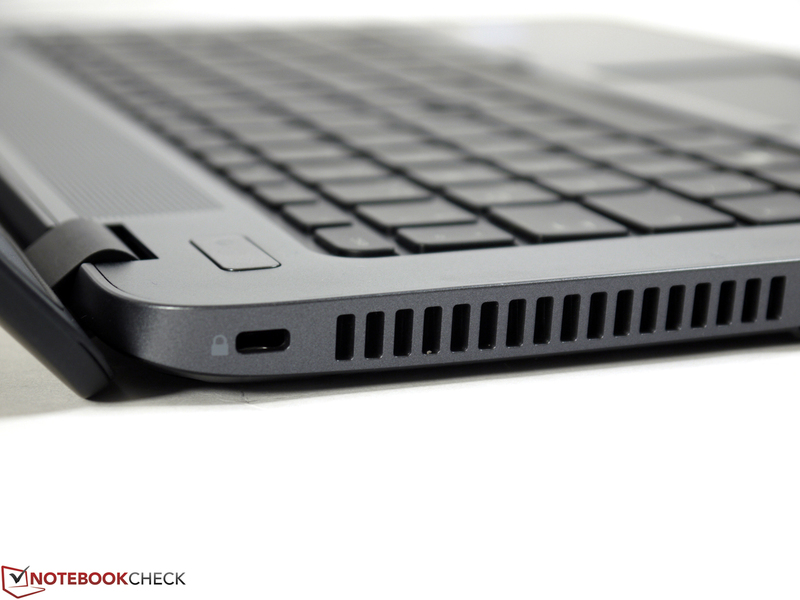 The HP ZBook 14 is significantly thinner, lighter and represents the fashionable ultrabook design. ...even though it can only keep up or beat the competition from Nvidia in some scenarios. We are much more convinced by the Full HD IPS display. It is bright, has good viewing angles and it is pretty frugal. The maximum opening angle on the other hand is limited. Port variety is good, but the layout could be better. The cooling solution works well, only the fan exhaust reaches temperatures of up to 50 °C. Materials not only look good, they improve the handling as well. The hinges do an excellent job and keep the display in position. 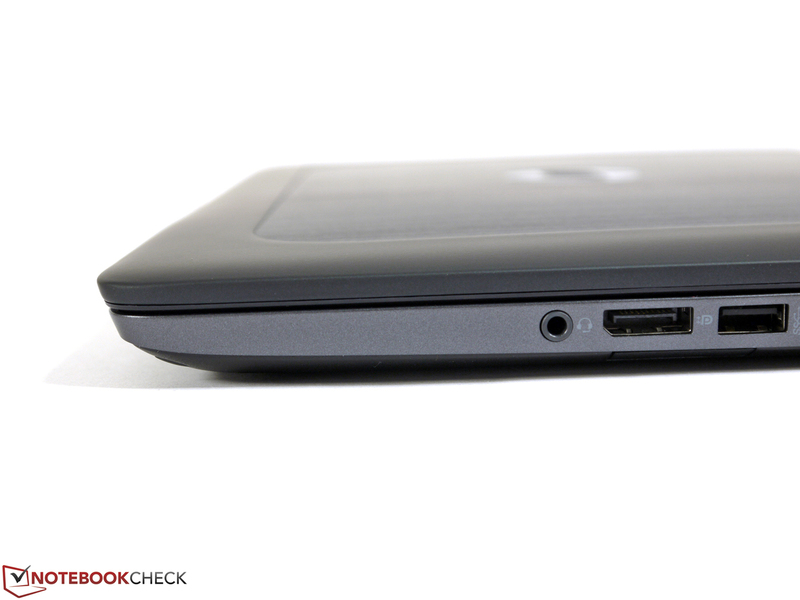 The HP ZBook 14 offers long battery runtimes and a good mobility. External displays can be attached via DisplayPort. All the ports are on the two sides of the case. Even the proprietary docking port is here. The excellent input devices hardly cause any criticism. The 720p webcam is only suited for well-lit environments. The power cable sticks out pretty far. The card reader is tricky to find and memory cards are protruding. 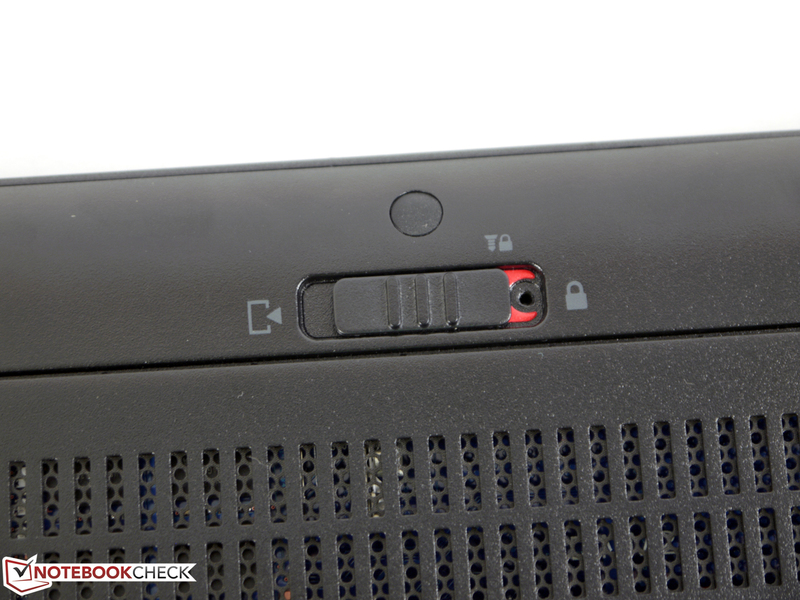 A full Ethernet port is also provided by the ZBook 14. All important components are underneath the large maintenance cover. 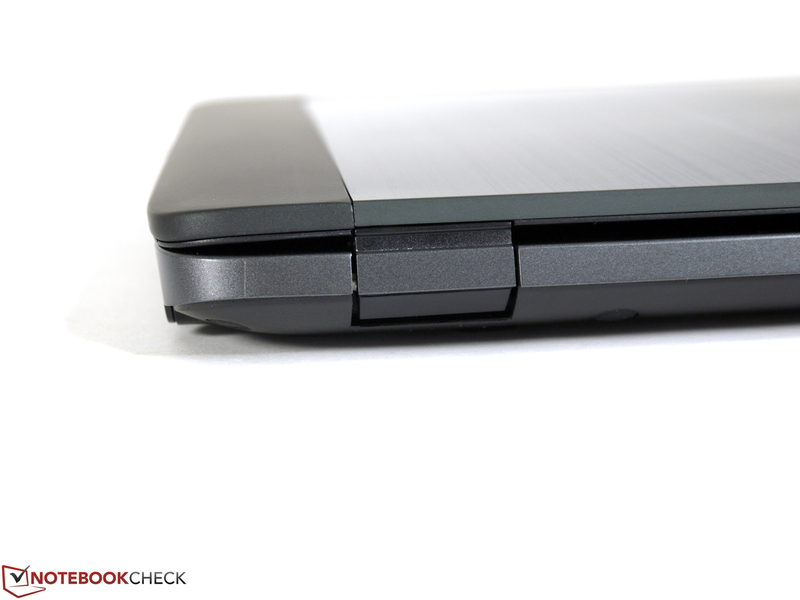 HP designed a secondary battery that can be attached at the bottom. The bottom cover is secured without screws. 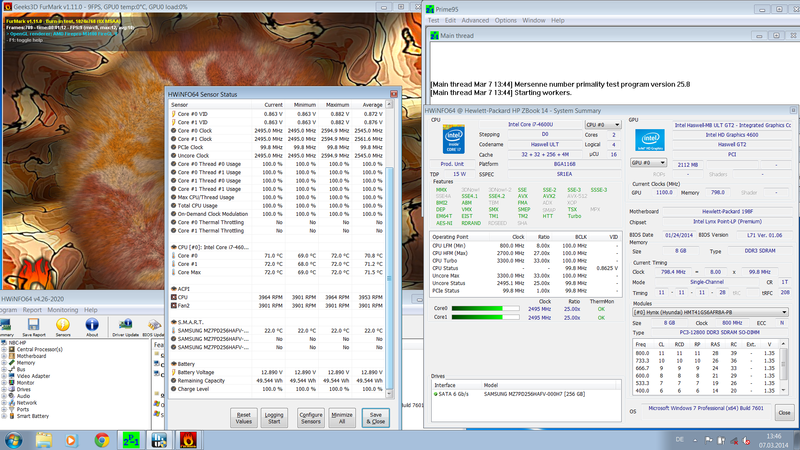 Upgrading RAM and WWAN is especially easy. You can only use M.2 SSDs with a length of 42 mm. 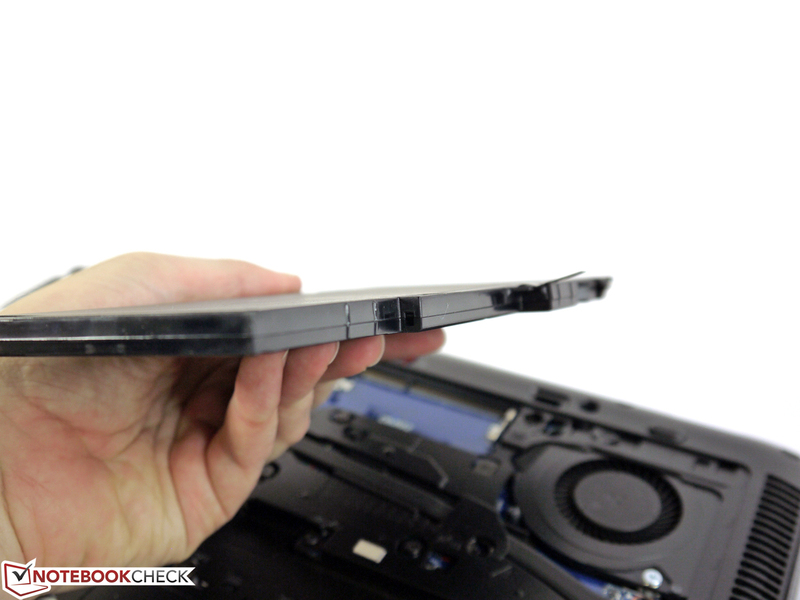 Samsung's SSD 840 Pro is very fast and provides an excellent system performance. The battery is also secured without screws and can easily be removed. There is also a SIM slot. One memory slot is empty. The fan does a very good job. The overall package of CAD capabilities in combination with the very good display and the very appealing mobility. More space between the ports, another more powerful graphics card and better color accuracy values for cyan. 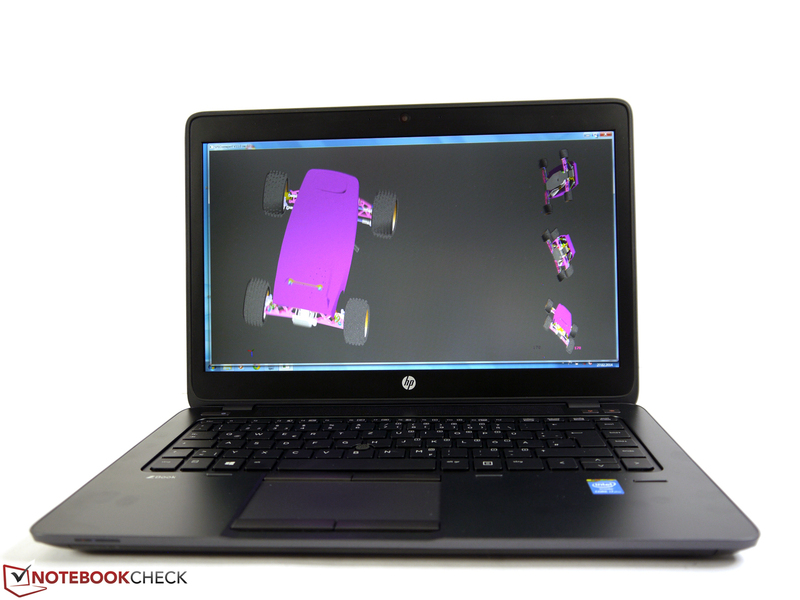 That HP realized a mobile workstation in an ultrabook format with the ZBook 14, they implemented the concept of the Dell Precision M3800 much more consistently.